For many people it may be obvious that by using your local library, you would save money, but many people don't even utilize their library! According to a 2016 Study on Libraries by the Pew Research Center, "just under half of all those age 16 and older (48 percent) say they have visited a public library…in person in the prior year." That means that 52 percent of us haven't stepped into a library in the past year. Libraries have a lot of options now a days, and you'd be surprised by what you'll find! Obviously, the library has books, but if you're looking for a way to keep costs down, but still get some entertainment – borrowing books may be the way to go. Recently I've been reading a recently released three-book series. While in the past, I probably would have ordered all three books online or through my kindle, instead I checked them out from the library, and saved $50! This doesn't even include children's books, which can run you anywhere from $5 to $10 for each new book. By checking out 3-5 books each time we visit with my son, we've easily saved over $200 this year so far. As an Extension Educator, I spend a lot of time in libraries putting on education programs in personal finance. Libraries are the place to be if you want to learn more about a topic from an educator or find a new hobby. According to a 2017 PEW Research study, it found that "65% of Americans think libraries help them grow as people." Libraries are the hub where they can bring a new topic or idea to light with an educational program. Libraries have tons of free or low cost options, including but not limited to – movies, television shows, music, and magazine rentals. Occasionally a library may offer a free movie event or fun workshop. Libraries have expanded their rentals to outside of books; you just have to get a library card to gain access! 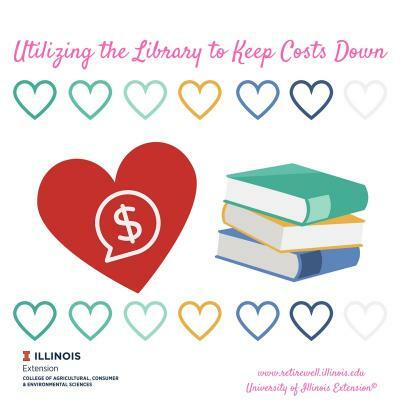 For our household, having the library helps to reduce costs on items we want. Reading, education and entertainment are all important, but by utilizing the library, we can save money in our budget. Not sure what your library offers? Find out on their website or drop in and ask a librarian. Alternatively, get on their email list and see what events they are doing.